there is nothing like making your own homemade stocks. the slow simmering process extracts the goodness and vitamins that are excellent for your family’s health. making your own stocks have to be the easiest and fastest way to save money. the main reason being, most of the things you throw in the trash can be used to make a stock. nothing can be easier than throwing those items in a pot with some aromatics that will give you the best tasting meals, along with money saved. although making your own stocks is not an exact science, it allow you to customize the exact flavor that you seek. we cook with many fresh vegetables. any part of the veggie that you would discard can be kept to make a broth, especially the skin. there is an amazing amount of vitamin and mineral content in skin! and those are just a few! skins, ends of the veggies and unused parts can be frozen and saved to make a stock. i suggest saving those items in a large freezer bag. when you have a generous savings of veggies, place them in a large pot, cover with water and add any other aromatics of your choosing such as peppercorns, fresh herbs, bay leaves and dried seasonings. bring to boil and simmer for at least 2 hours until veggies are tender and flavors gel together. strain through a sieve and store in the fridge or freeze! you can also invest in cheap cuts, like the neck bones which makes great stocks as well. you can combine the bones and carcasses of meats with some of the frozen veggies you saved. it is truly up to you based on the flavor you would like to accomplish. 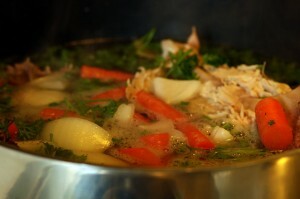 a great way to add depth and deepen the flavor of your broth is to roast your bones. it will create a darker, richer broth. you can freeze your broths by putting them in freezer bags for up to 6 months. i like to freeze my broths in cup measurements, so it is easier to know exactly how much to defrost. to remove the fat from your stock, place in the refrigerator. once the stock is cold, remove the hardened layer of fat from the top surface. make your stock in a slow cooker. throw all of your ingredients in a slow cooker and turn it on. the longer it cooks the better.